You might be aware of the recent sacking of the President of the University of Virginia by the Board of Visitors and the reinstatement that followed over the last several weeks. I take particular interest in this for three reasons: First because both of my children graduated from UVA, and, as a family, we take great pride in the university; Second because Teresa Sullivan, the President, is the first female president of Mr. Jefferson’s University and has a CV that leads me to believe that she is the right person to lead the university well into the 21 Century; and Third because I am a supporter of liberal arts education, and I do not think that STEM (science-technology-engineering-math) should supplant the classics in all educational settings today—-especially at UVA. Although I understand and appreciate the STEM approach, I also know that world peace is high on my list of global objectives, and solving it—-or even meeting the myriad diplomatic challenges around the world—will take people with educations that center on past as prologue and understanding our futures based on the lessons of the past. The STEM approach will surely be necessary to assist in accomplishing those goals, but the lessons gained from a liberal arts education will be critical to success in the long-range missions. There is a place for both approaches. However, changing the core values of UVA as a bow to the power brokers of the graduate business school crowd and the profit merchants is out of place, and I was happy to see the right result come out of a tumultuous week in Charlottesville. There were a few gems in all that I read about Teresa Sullivan and the University of Virginia over the past week. Among them were the writings of Thomas Jefferson about his concept for a great university, which seem as relevant today as they were in the Nineteenth Century. However, the gem that made me think of all of you was a list of what the Washington Post described as Sullivan’s Laws in an article on June 26, 2012 titled “She has the people. Is it enough? '” The list enumerates what Teresa Sullivan expects from those who have worked for her at places like the University of Texas and the University of Michigan and who work for her now at the University of Virginia. These Laws can just as easily apply to business and law or any field where leadership is important. Here they are. See what you think. *When dealing with a difficult matter, don’t leave anyone out. These Laws make perfect sense to me, and I believe that if you follow them, you not only will become a good leader yourself but you also will know how to interact with good leaders. Most of all, as the Laws evidence, transparency and honesty are expected at all times. Too bad the Board of Visitors did not read these Laws well in advance of its ill-advised surreptitious action over the the last two weeks. In fact, if the board members had read the tag line for the last Law, which reads, “or else be prepared for fall-out,” they might have known what they were up against. The recent article in the July/August edition of Atlantic magazine by Anne-Marie Slaughter, “Why Women Still Can’t Have It All,” hit the news stands and the Internet last Friday and has caused nothing short of a frenzy. The following Monday, Professor Slaughter stated on MSNBC Morning Joe that the on-line article already had received 800,000 hits. The editor of Atlantic that same day reported in an interview on NPR that the article received the most activity of any article in the history of the magazine. So, what’s the frenzy all about? What is causing the buzz? Well the buzz for me is likely to be a little different than the buzz for most other readers. 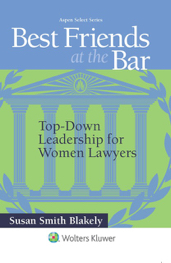 The experience of the author is consistent with the stories that I have heard from so many women lawyers, including the over 70 women lawyers who have contributed accounts of their personal experiences to the Best Friends at the Bar project. The article, which really is an essay, and the reaction to it completely validate the work that Best Friends at the Bar has been doing on behalf of women lawyers for the last five years. In fact, for those of us who have been spreading the messages of Best Friends at the Bar, reading the essay is like hearing an echo in the room. “You cannot have it all” is a message that runs throughout our work. You can have some of it all of the time, all of it some of the time, but it is the rare woman lawyer who can have all of it all of the time. For other readers, the essay raised issues that they either had never given thought to or were buried so deep in their own experiences that unleashing them was like turning on a fire hose. The result was powerful and hard to control, and the responses evidenced just how deep the issues of competing interests and the feelings of inadequacy and despair by working mothers are imbedded in the fabric of family life in America. What makes Professor Slaughter’s article so relevant to my work is that she is a lawyer, and she is writing about things that are very personal to her as a lawyer and a mother. She had a very high level job at the State Department before she resigned her position to return to teaching at Princeton to accommodate the needs of her family. In the essay, she alludes to a difficult time in the life of her teenage son and the hard choice that she faced in deciding to leave a job she loved to spend more time with her family. It’s a common theme, and, if you have read the Best Friends at the Bar books, you have heard it from me, from my contributors, and you will hear it again from the women, who are profiled in the second book that is due out soon. These personal stories are important to us not only as examples that resonate but also because they make us understand that we are not alone. There are no easy answers, and that is just as clear from the essay as it is in my books. There is no single solution to these dilemmas, and it is different for every woman. Some women lawyers will make it to the corner office and take their seats at the partnership tables, and some will not. For those who do not, I hope that they will find flexible work arrangements or alternate practice settings that will allow them to stay in the profession and make it through the most challenging years of the work-life struggle. We must respect all choices, and we must strive to find the balance that works for each of us, understanding that the balance will shift during our careers and there will be times of greater career opportunities and times of more limited career opportunities, depending upon the situations in our personal lives. Understanding the need for that flexibility and embracing it as the rhythm of life is key to finding the balance and being happy with our choices. The “You Can Have It All” Kool Aid of the 60’s and 70’s was just that. I know. I was there. I lived it, and I have had to struggle to continue in my profession, become a partner in a law firm and raise two children—including my daughter, who just graduated from law school—-all while being married to a fellow litigator. My husband and I celebrate our 42nd wedding anniversary this year, and every year at this time we toast ourselves for having made it in spite of those challenges. To make it work, I have practiced law full time, part time, as of counsel, as a partner, as a chief of staff in public service, and I have taken leave of my practice for critical years when I knew that I had to be home with my children. It has not been easy, but it has been worth it. I am not proudest of graduating from a top law school and becoming a partner in a law firm. I am proudest of staying in my profession and making it work. It is for my daughter and all the young women lawyers that I write, speak and shed light on these issues whenever possible. My message is, “Stay in your profession one way or another. If your time is not now, it will come.” The emphasis in my writing and speaking is on personal definitions of success, throwing off the male stereotypes for success that do not work for most women, making good choices and good career plans and celebrating success at every opportunity. Underlying all of this is the discussion of finding the balance that works for each individual woman and for her family. 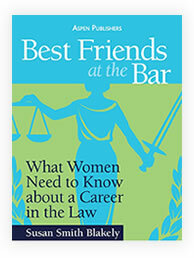 I hope that you will check out the Best Friends at the Bar project on my web site, www.bestfriendsatthebar.com, and read a chapter of my first book, Best Friends at the Bar: What Women Need to Know about a Career in the Law (Wolters Kluwer/Aspen Publishers 2009) on Amazon. 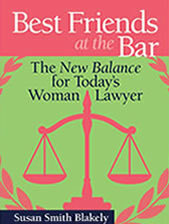 My second book, Best Friends at the Bar: The New Balance for Today’s Woman Lawyer will be released by Wolters Kluwer Law & Business in July and will be available for purchase on Amazon soon. The new balance that I propose is work-self-home and family, and the book explores the importance of self and its role as critical to success and happiness in both personal and professional lives. The example of Anne-Marie Slaughter is one of staying true to self. I applaud her decision and the bravery she has demonstrated by sharing her story with all of us. Should law schools be more like medical schools as teaching institutions? No, I am not suggesting pulling a week’s worth of all-nighters and hooking up with every hot body in every nook and cranny of the hospital (Grey’s Anatomy style) and justifying it because of fatigue, the absence of other forms of recreation and basic bodily instincts that medical students seem to view a little differently than the general population. I have thought about it, a lot, and I think that Professor Moliterno is right on, as is Professor Bill Henderson at Indiana University Mauer School of Law. I have written about him in prior blogs and in my books, and I admire his efforts to bring attention to adding more practicum to the law school curriculum. “The medical residency system gives fledgling doctors real-world experience under close supervision, so why doesn’t anything similar exist for new lawyers beyond the sink-or-swim associate system?” National Law Journal as reported in Above the Law. In response to this observation, Dean Sylvester initiated what may be the first large-scale, nonprofit training law firm affiliated with a law school. The Arizona State University Law (ASU Law) program is still in its nascent stages, but I am inspired by the concept. As one would expect, Above the Law (ATL) is skeptical because of the practice by some law schools of hiding unemployed law graduates in a program like this to keep the law school placement statistics looking good. Also, as you would expect, ATL advocates for total transparency in this—and all things, of course. These are important issues, but they beg the question of whether such programs are important to legal education and beneficial to the profession. To its credit, however, ATL also identifies a second benefit from this program: providing low-cost legal services to people who need them. Although the program plans are still in the works, it is projected that experienced attorneys would be hired to supervise as many as 15 to 30 “resident lawyers,” recent ASU Law grads (AHA………now you get the ATL skepticism…….right? ), who would gain experience in various practice areas over a two-year time period. The rate for service would be low, and any profits would be used toward scholarships. This new program is very exciting, as the only “not-for-profit law firm” sponsored by a law school to have come on the scene so far. However, it is not the only effective OJT training effort among law schools. Other efforts, like the diverse and wide-range clinical programs that I have reported about in the past at law schools like Georgetown University Law Center, come to mind. These are very bona fide attempts at teaching practicum, but they are not full-time programs, and they compete with students’ other curriculum requirements. As a result, these programs hardly can be as effective in preparing students for practice as the one being planned at ASU Law. I hope that we see more of these innovative efforts sooner rather than later in law schools. 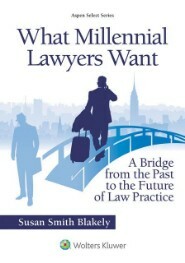 The biggest complaint that I hear from law firm partners is that recent law graduates have no practical practice skills. (Well, also that they are younger, cuter, faster on the baseball field, etc, to be fair about it…… but I digress.) Here is a way of significantly improving practice skills, and these same partners should be leaning on their law school alma maters to follow the lead. Do you think that law schools need more OTJ training in the curriculum? Would you like to participate in such a program—-in lieu of the big bucks of private practice for a few years? Let me hear from you. As always, I will keep you posted on future developments! It requires less character to discover the faults of others, than to tolerate them.